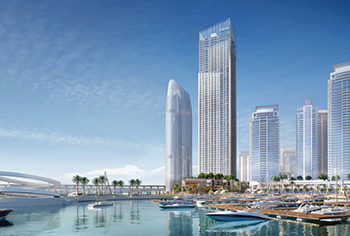 The Grand is an ‘ultra-luxe’ residential address at Dubai Creek Harbour. Dubai-based Emaar Development has unveiled a collection of ultra-luxury apartments, penthouses and podium-level townhouses in The Grand, a spectacularly designed residential tower located near the heart of Creek Island at Dubai Creek Harbour. The limited-edition launch represents a once-in-a-lifetime opportunity in this community, says Emaar Development, the build-to-sell property development unit of Emaar Properties. The Grand is an ‘ultra-luxe’ residential address in the 6-sq-km Dubai Creek Harbour. Set by the historic Dubai Creek, the mega-development is also near the Ras Al Khor Wildlife Sanctuary, protected under the Unesco Ramsar Convention and home to over 450 animal species. At 62 storeys, The Grand features premium one-, two-, and three-bedroom apartments, four-bedroom penthouses, and spacious podium-level townhouses with private gardens. The Grand offers resort-style living with upper-level homes opening to uninterrupted views of the new global icon, Dubai Creek Tower, and the Downtown Dubai skyline. Residents step out to a thriving waterfront promenade, with an upcoming high-end retail district in Dubai Creek Harbour also in close proximity. They also have exclusive access to a distinctive lounge space on the rooftop. Marine enthusiasts will have added value with the world-class marina that can berth yachts of various sizes. The Grand delivers high quality social, leisure, health and general well-being amenities. Among the lifestyle choices are an iconic infinity pool, cabanas, play areas, gymnasium, tennis court, multi-purpose sports lawn, barbecue area, and more. The Grand also offers a wide range of podium-level amenities tailored for families.